Hello everyone, sorry it’s been a while since my last post. This post is about the North Atlantic Oscillation – an atmospheric phenomenon that heavily influences the northern hemisphere’s (NH) climate, especially in the winter. Firstly, I think it good to get some grounding on the NH jet stream. The video below from the Met Office introduces it pretty well and shows how the stream can fluctuate. The North Atlantic Oscillation (NAO) can have a large impact on the strength of the jet stream. When the jet stream is weakened its direction can change more often (which is why UK weather can be pretty variable!). The best way to describe the NAO is as a particular state of the atmosphere which can change between so called ‘positive’ and ‘negative’ phases, like a seesaw. 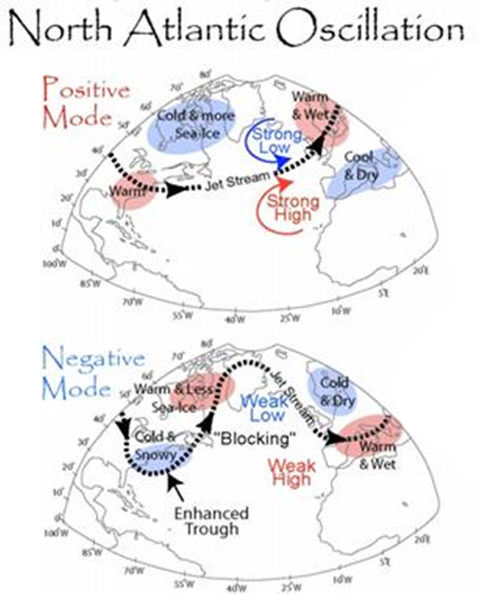 These phases are identified by calculating pressure differences between the Azores and Iceland. The Azores has a typically high pressure and Iceland has a low pressure, however this difference can vary in magnitude. The diagram below shows that in a positive phase there is a large difference between high and low pressures, and in a negative phase there is a small difference. If you look closely on the diagram you can see the outline of Europe and Africa to the right of the NAO. The NAO positive and negative phases. Sourced from here. Depending on if the NAO is in positive or negative phase then the jet stream is affected differently. The diagram below shows the position of the jet stream when the NAO is positive and negative. In the NAO positive phase the jet stream is coming to the UK from the south west, bringing with it warm, wet air. Conveniently for the UK, in the winter/spring time the jet stream is also pointing in this direction, bringing us wet weather which is relatively warm compared to other places in the world at this latitude. In the negative phase, the jet stream is coming from the north, bringing cooler, much drier air. This may sound like the wrong way around (warm air being experienced in the winter) but this is one of the reasons the UK experiences a temperate climate. How the Jet stream can change with the phases of the NAO. Modified from original source here. In the summer of 2007 and 2012 Britain experienced severe flooding and as the NAO was uncharacteristically in its positive phase, and so the jet stream brought with it much more moist air, which turned to rain. The picture below just shows the effect of the NAO in a more simplistic way. Of course there are many other events that can affect the UK’s weather (the Gulf Stream for example) and there are other types of oscillations that occur elsewhere in the world but this particular one can strongly influence how nice the UK’s summers will be! In my last post (4.5 Billion Years of the Earth’s Temperature) I mention the Medieval Warming Period. This was when Europe experienced higher atmospheric temperatures than today. It occurred between 1000-1400 AD, and it was recently established that the NAO was one of the major driving forces behind this event. It is thought that the NAO was stuck in a very strongly positive phase, blowing vast amounts of warm air over Europe for an extended period of time. For more information on the medieval warming period follow this link. As the global climate changes and the world becomes warmer, it is predicted that this will have an effect on the NAO. The oscillation between positive and negative phases is thought to increase in frequency so we will experience a more variable climate within our normal seasons. This is due to changes in the Earth’s circulation cells which I hope to explain in more detail in another post! I hope you found this post interesting, as always please post any comments or questions below!